TAGnepal is proud to have a group of tourism professionals and international climbing experts with years of experience in the field of trekking, expedition, tours with many national and international mountaineering companies. Apart from our efficient and ever-aspiring management team, all our Climbing and Trekking guides are well trained, licensed/certified and efficient at speaking English language. All our members' experiences and professional academics add value to our services, and make everyone an indispensable part of the whole Team. The experiences, skill and spirit of the whole team have successfully made us the “Partner” every traveller would love to have in their travel experience. Gobinda Gurung, a dynamic personality, was born in an army family in a remote village of Lamjung district, a naturally rich place that lies on the trails of Annapurna Circuit. After completion of his higher studies in Business Management, he dedicated himself in the field of trekking and mountaineering. Within few years of his working career, he became renowned as an experienced and hard working personnel. Now, he holds years of experience working with numerous trekking and expedition companies as travel and tour operating manager. 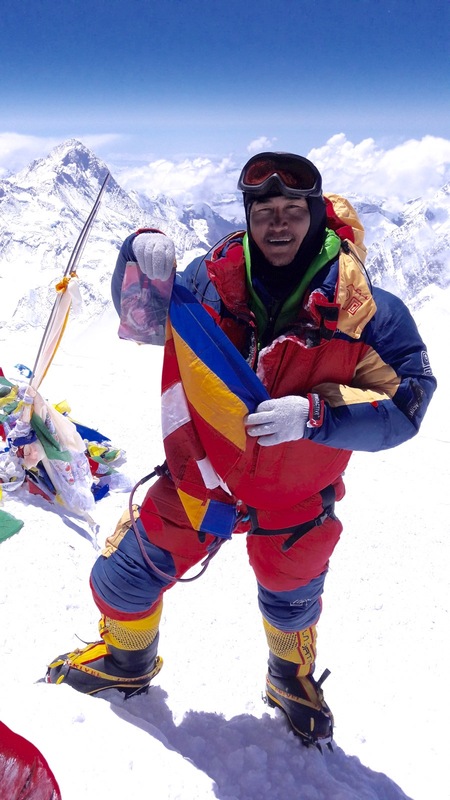 In addition to his managerial skills, he is also a certified mountaineer and has done numerous mountaineering activities throughout Nepali Himalayas. He has visited different countries in Asia and Europe for promoting Nepali tourism. Till date he has visited more than 10 different countries in Europe and Asia. He is also involved in various social welfare activities. His attachment in different social clubs both as an advisor and member, reflects him as a socially responsible person. He has volunteered in international marathon held in Gobi Desert in China. Besides, he is also a member in district tourism board. He has played a major role as volunteer and relief distributor in numerous earthquake relief campaigns after the massive earthquake that occurred in Nepal on 25th April 2015. His contribution to rescue and relief campaigns has helped him gain various salutations from different sectors including the Government of Nepal. One of his significant interests is photography. He is involved in promoting different cultures of Nepali communities by utilizing his skills in documentary making and cultural photography. As an avid traveller, he believes that traveling is the best way to get the real knowledge and experience of life. Tendi Shepa was born in the village of Khembalung, a mountainous region of Sankhuwasabha District of Nepal in 1983. Following the footsteps of his mountaineer father, he started his trekking and mountaineering career when he was just 13 years. In 20 years’ time, his juvenile involvement in the field turned into his passion, profession and achievement. Now, he is an IFMGA/UIAGM Certified Mountain Guide with 11 successful summits of Mt. Everest and years of mountaineering and trekking experiences in the Himalaya, Europe (Alps), South America (Andes) and China. In addition, he is also a high altitude rescue professional. He took rescue training on Longline Helicopter rescue in 2011 at Sion, Switzerland by Air Glacier, FXB, Bagnoud du Sauvetage, Maison Francois. Since then, he has also been involving in various rescue missions in Nepal and abroad. He is very keen on sharing his Himalayan culture and magnificent mountaineering and trekking experiences with the adventure community worldwide. He also loves to serve the deprived communities in Nepal. He is involved in different social organizations in Nepal. Currently, he is the treasurer of “Nepali ko Sathi,” a Swiss funded NGO for supporting education, health and other developmental activities in the remote villages of Nepal. He is also a dedicated member of Nepal National Mountain Guide Association (NNMGA). Sagar Poudyal is an experienced professional in tour, trekking and expedition operations with more than 10 years of experience. After his graduation in Masters’ Degree of Business Administration, he started his professional career as an auditing practitioner in one of the highly reputed chartered accounting firms. Later, he grew an interest in adventure operations and joined the field of travel and adventure industry in 2004. Since then, he has been successfully operating numerous Tours, Treks and Expeditions including the highly ambitious operations in Mt. Everest, Mt. Lhotse, Mt. Cho Oyu and Mt. Manaslu. He has valuable experiences of working with highly acclaimed international Adventure Outfitters including Benegas Brothers Expedition Inc. Utha, USA; Mountain Madness Inc, Seattle, USA; Rainier Mountaineering Inc, Seattle, USA etc. In addition to his managerial expertise in adventure industry, he has also got the experiences of working with renowned international development agencies like The World Conservation Union (IUCN) and National Democratic Institute for International Affairs (NDI), where he got an opportunity to understand the socio-cultural values in cross-cultural working environment. Apart from his professional life, he is also involved in the field of social services. He has been running Hans Education Project since 2010 where he actively participates in monitoring and evaluating three different school projects. He is also involved in SOS Children Village, Jorpati as a High Valued Sponsor. Similarly, he is also a member of Rotary Club of Kathmandu, a well-known social institute established for community services. 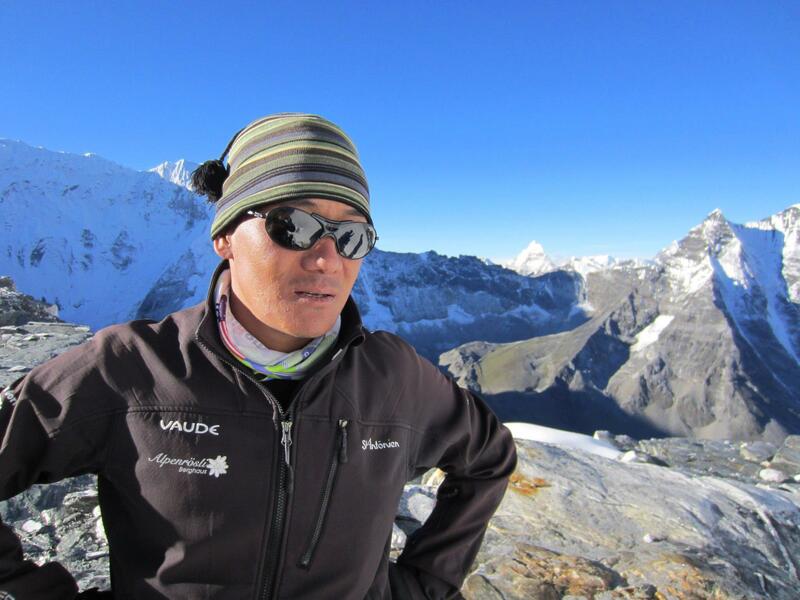 Born in Gudel-4, Solukhumbu, Tendi Sherpa is a veteran Mountain Guide and Climbing Instructor. 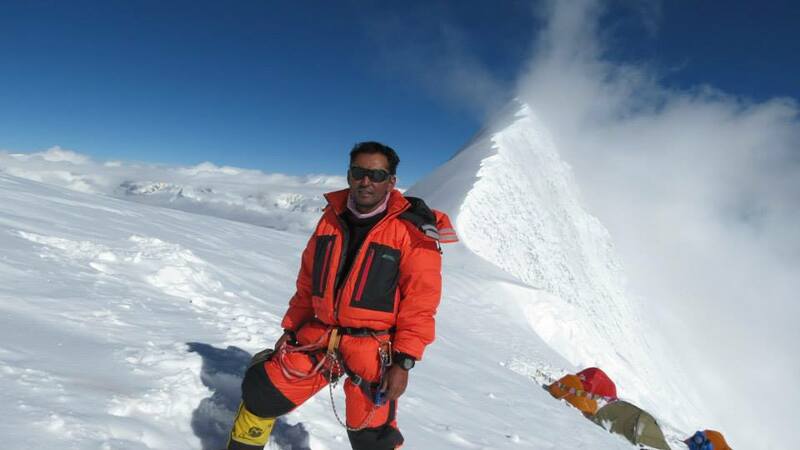 He started his professional mountaineering by climbing Mera Peak (6472m) in 2000. And the rest is history! Till now, he has climbed mountains for more than 100 times including Mt. Everest, other Himalayan giants, and French and Italian peaks. He started his professional Instructor career in 2006. Since then, he has been working as a Chief Instructor of internationally recognized climbing courses including BMC, AMC and Aspirant Guide Course in Nepal Mountaineering Association (NMA). 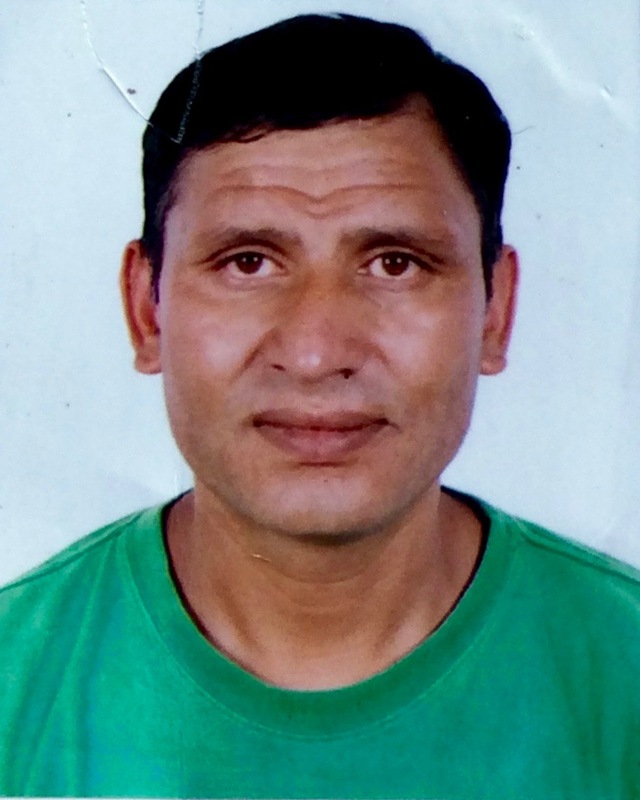 He also worked as a Technical Personnel in Nepal National Mountain Guides’ Association (NNMGA) from 2009 to 2012. During this time, he collaborated with Swiss and French Mountain Guide Association, and led an official interaction program to share the climbing culture among different mountaineering communities. He has led numerous successful Expeditions including “Nepali and French Women Amadablam Expedition 2011”, “First Albanian National Expedition 2012 (100% success)” to name a few. Apart from mountaineering, he is also a Mountain Biking Guide with numbers of international experiences in Tibet, Germany, Austria and Italy. He has travelled extensively in different countries including Tibet, China, Germany, Italy, Austria, USA, France, Swiss, Thailand etc in the course of climbing, instructing and biking. In addition, he is also a rescue specialist with significant involvements in Search and Rescue Missions like Ghunsa Helicopter Tragedy (2006), Everest Expedition Rescue (2007), Korean Expedition Manaslu Rescue (2009), French Expedition Manaslu Rescue (2013) etc. Paras Manandhar, an MBA graduate with specialization in Financial Management, has been in the field of finance and administration for more than 12 years. He stared his career as an Accountant in Hotel Shangri-La in 2004. 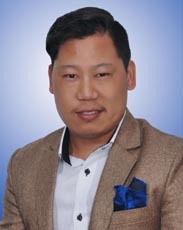 Since then, he has been involved in numerous organizations including Aphanta Saving and Credit Co-operative Ltd. and Sagarmatha Multiple College. 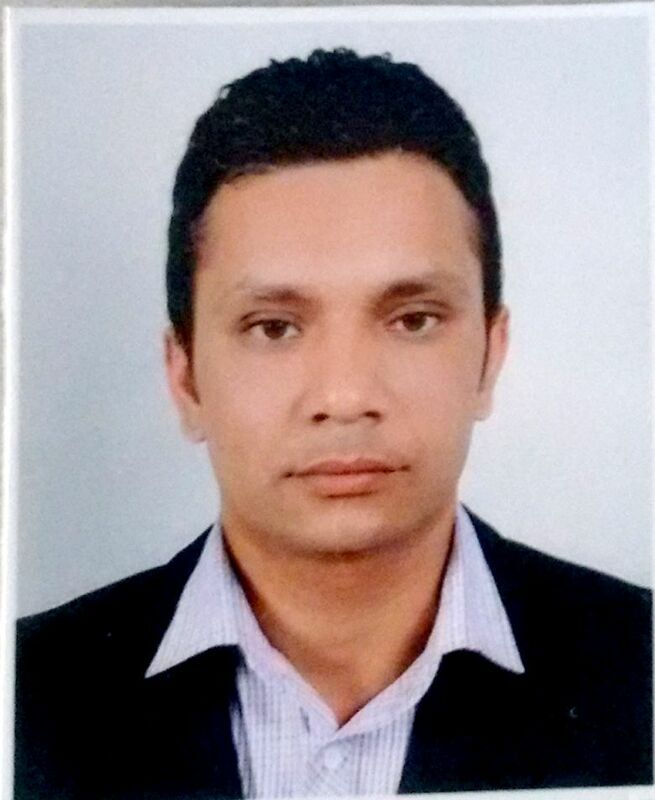 Beside his experience in the field of finance, he has also worked as a District Administrative Officer in Nepal Red Cross Society, Lalitpur Chapter, which gives him a wider knowledge of administration and public relations. As a young and experienced personnel, he has always been a crucial member of the team and has been contributing significantly for the growth and success of the company. 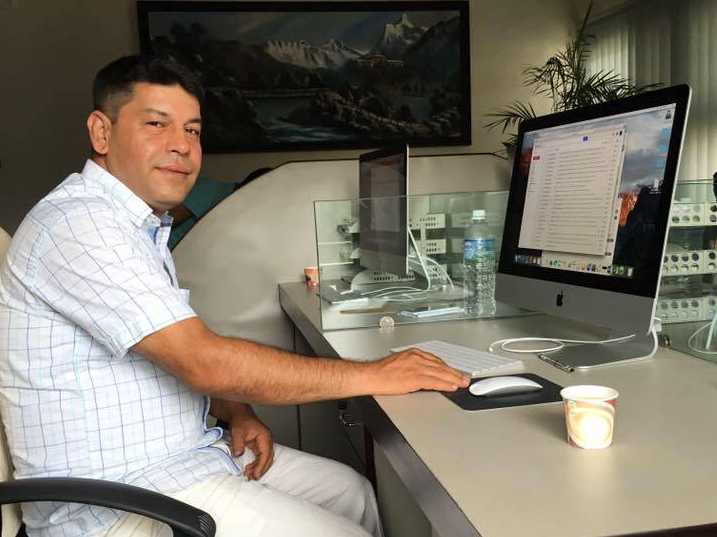 Menuka Gurung, a permanent resident of Kathmandu, is a Content Writer and Teacher by profession. She is an MA (English literature, 2005) and MBA (Tourism Management 2011, UK) graduate. Currently, she is pursing M. Phil in English. After her graduation in Tourism Management, she started to work in the field of Tourism as Sales and Marketing Executive, Instructor and Content Writer. Now, she is working as a Content Writer and concurrently, teaching the graduate and postgraduate students in different colleges. Her expertise in language with management academic has added excellence to her performance, which in turn is helping the overall performance of the team. 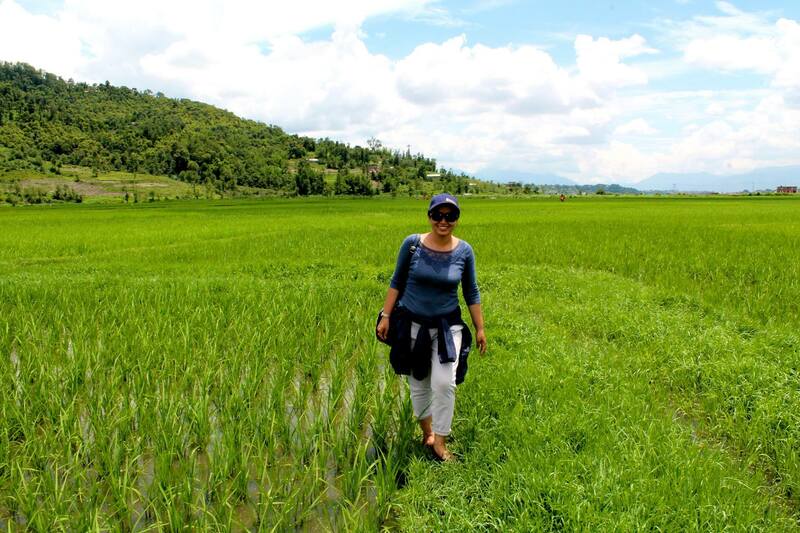 As a responsible youth, she aims at contributing to Nepali Tourism by facilitating the young tourism workforce in the field and promoting Nepal as one of the must-visit destinations. Shyam Ranpaili, born in Salleri-5, Solukhumbu is an experienced personnel in the field of tourism. After he passed School Leaving Certificate (SLC), he did volunteering teaching for one year in his village. Later on, he was drawn towards trekking and started working as a support staff. During this time, he travelled extensively in the major trekking regions of Nepal including Everest (3 months in the Base Camp with Spanish Expedition Group), Manaslu, Annapurna, Langtang and Dolpa. 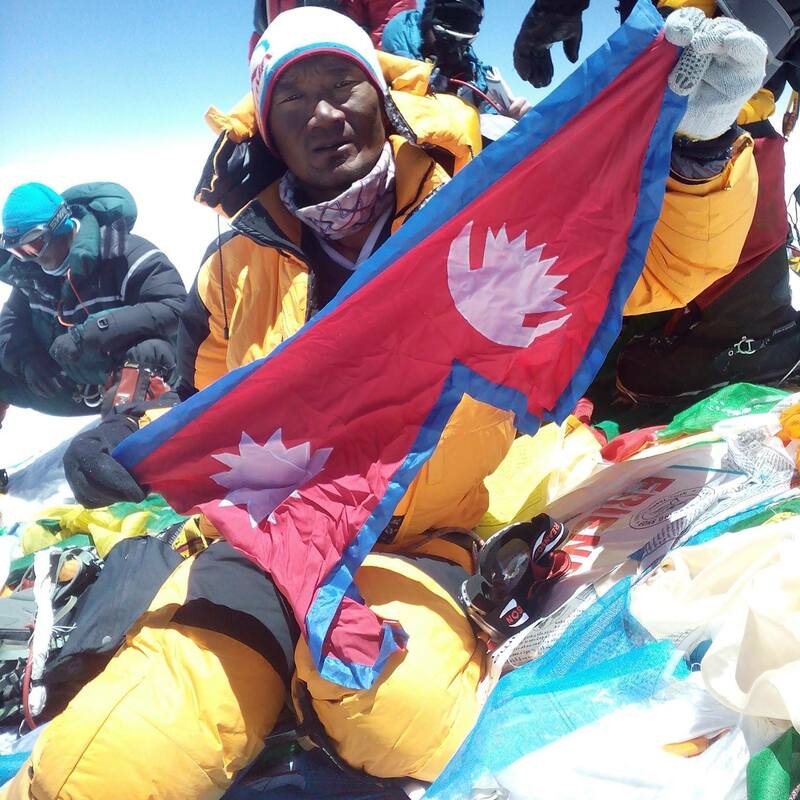 He also received Basic Mountaineering Training, which has proved to be an added value to his profession. Now, he is an administrative professional with more than two decades of experience in the field. His knowledge in mountaineering basics, wider travel experiences and efficient administrative skills have been regarded highly significant in the Team. Born in Waku Solukhumbu, Ang Pasang Sherpa started mountaineering in 2000. He is one of the most efficient guides in our team and is much loved by both guests and colleagues alike. 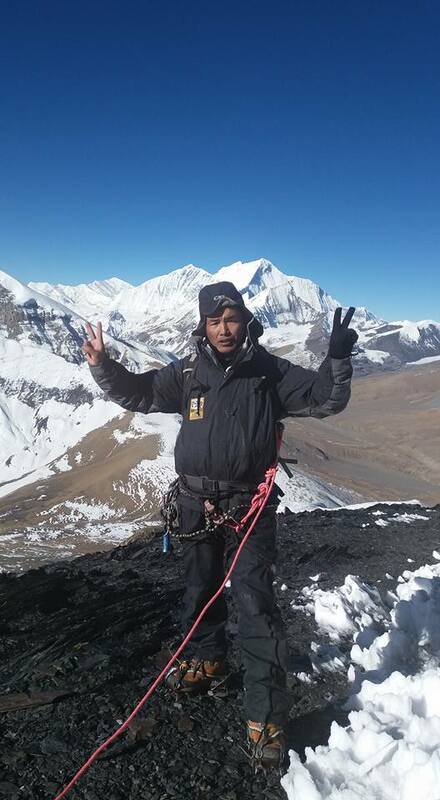 As a trained guide, he has received several trainings on Trekking Guide, Advance Mountaineering, First Aid, Rescue, Ice Climbing and Mountaineering Liaison Officer. Apart from English, his language proficiency includes German language as well. Till date, he has climbed the Himalayan mountains for more than 20 times including Everest 5 times (4 times from North and 1 time from South), Lhotse, Amadablam, Makalu and several trekking peaks. He is an expert in guiding both the trekking and mountaineering groups. 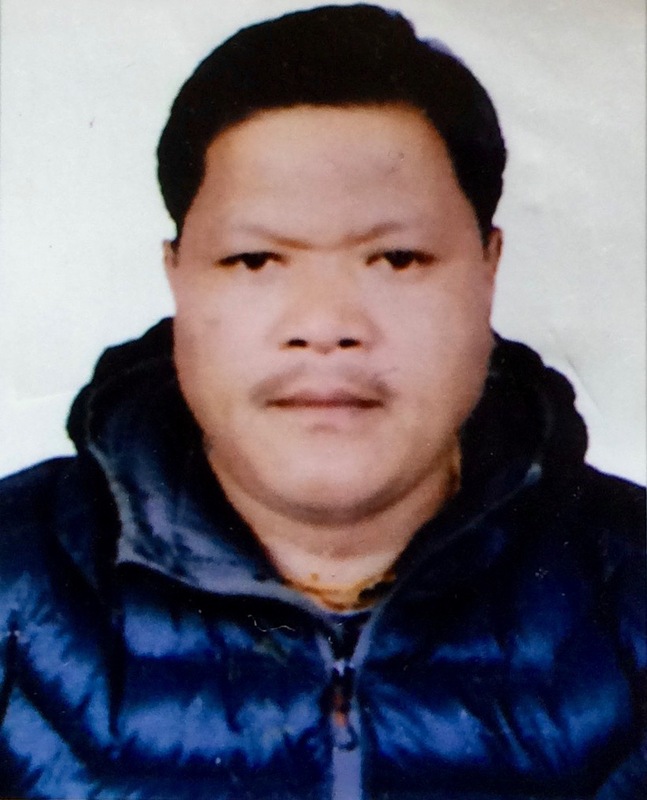 Nawang Chhongba Sherpa was born in Waku, Solukhumbu. He has received training in Mountaineering and Trekking. He also received the Mountaineering course from Alpine Association of Slovenia in 2013. 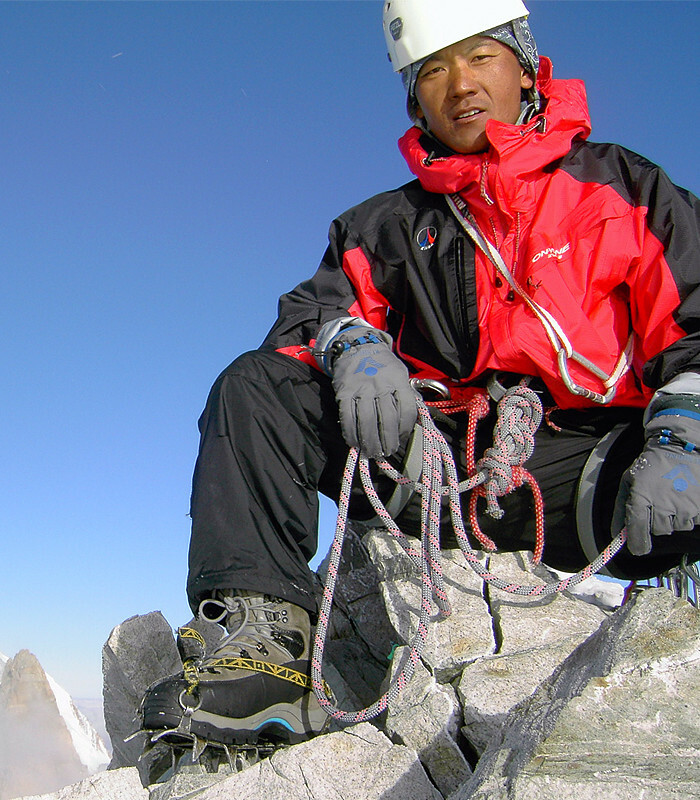 He started Mountaineering professionally in 2002 and has successfully climbed Mt. Everest two times till date. Apart from 8000+ mountains, he has also summited Mt. Amadablam, a well-known technical peak and many other Trekking Peaks. He has also led many trekking groups in different regions of Nepal. 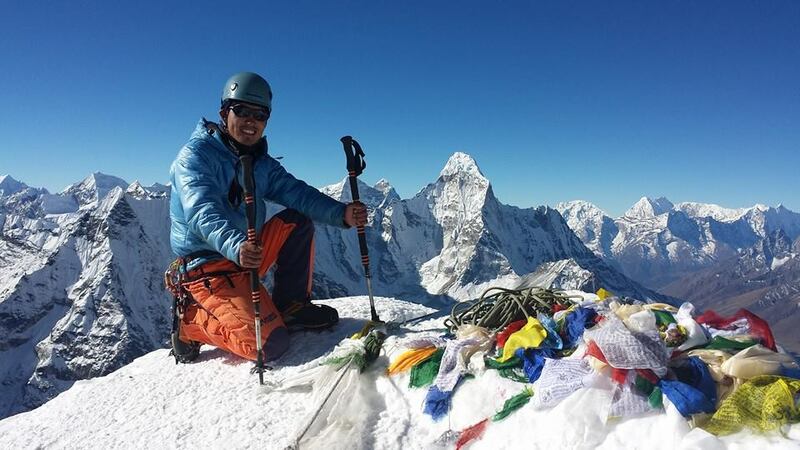 Pemba Rinji Sherpa, an inhabitant of Juving, Solukhumbu has been in the mountaineering profession since 2010. He has the climbing experience of both trekking peaks and mountains above 8000 including Mt. Everest. He is a trained guide and has also received “Khumbu Ice Training”. In addition to his climbing experience, he is also a very reliable hand in trekking as he has good experience of trekking in different parts of Nepal. 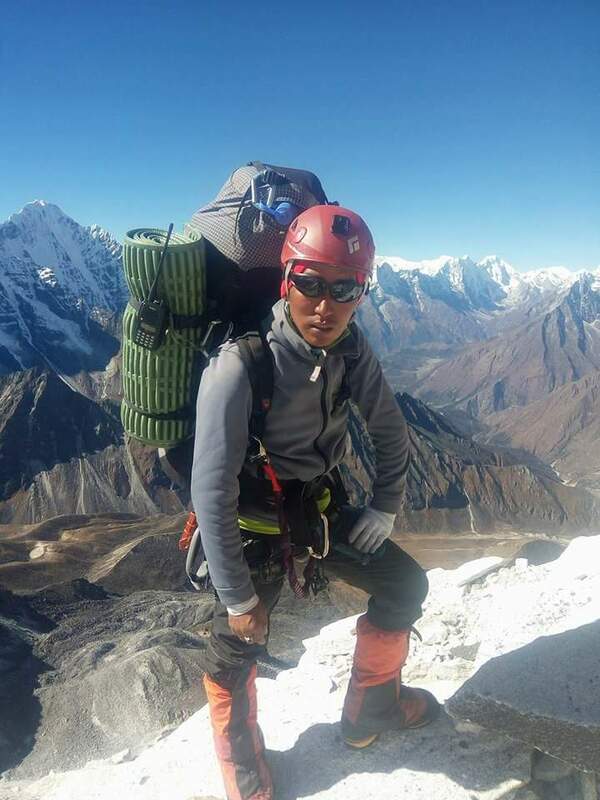 Palden Nima Sherpa born in Yaphu, Sankhuwasava, is a very experienced Climbing Guide with almost two decades of very impressive climbing history. His records show almost hundred percent of summit success in his each attempt. He started his professional climbing at the age of 20 and since then has summited Mt Everest 6 times (from both sides), Mt Amadablam and many Trekking Peaks. Like the other team members, he is also an expert in leading trekking groups as well. Pasang Tendi Sherpa was born in Juving, Solukhumbu. 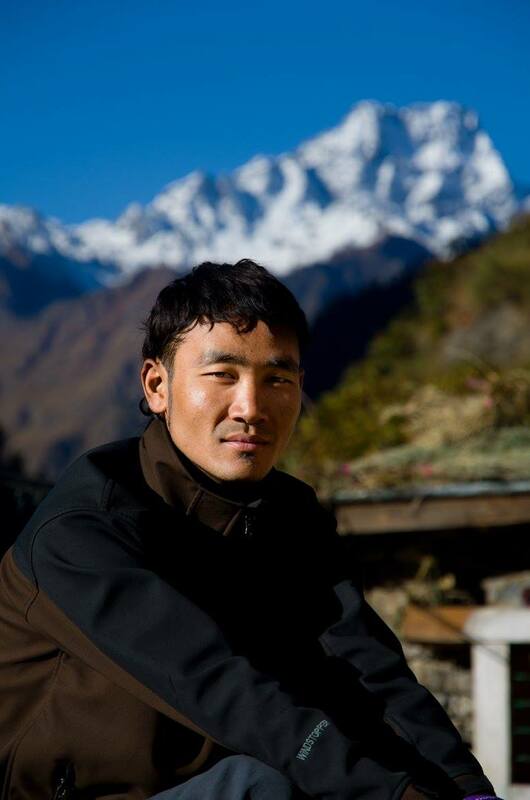 He is a trained Asparine Mountain Guide with both mountaineering and basic long land training. He has climbed 8000+ mountains ten times including Everest from North. Like wise, his experience profile also includes the successful ascent of Mt. Amdablam, more than 5 Trekking Peaks and High Passes like Amphu Lapcha, Ganjala Pass, Larkeyla Pass, Renjola Pass, Chola Pass etc. He is equally efficient in guiding trekking groups to various regions of Nepal. 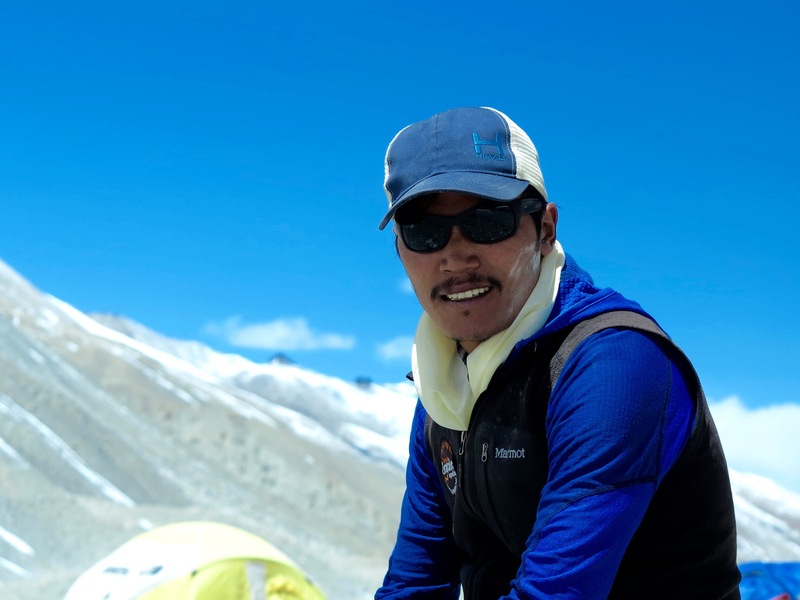 Bibek Pandey has been working as a Climbing Guide/Expedition Sardar and Trekking Guide in several popular trekking regions around Nepal and Tibet. He has got the experience of Everest Expedition, Cho Oyu Expedition, Sisapangma Expedition, Manaslu Expedition, Baruntse Expedition, Amadablam Expedition and some peaks namely Island Peak, Mera Peak, Labuje Peak, Yala Peak etc. He has been trained as a trekking guide conducted by Hotel Management and Tourism Center. He has completed his basic introductory mountaineering training conducted jointly by NMA and PETZL foundation of France. He is trained on advanced mountaineering conducted by NMA and has wilderness first aid training too. He is also a general member of Nepal Canyoning Association. Indira Joshi is a certified freelance tour guide working in the field for last 35 years. She is the first female guide in Nepal and leads tours in both English and Japanese, which gives her a competitive edge in the field. With her immense knowledge about Nepal’s history, geography and culture, experience and ever-smiling face, visitors are always happy with her service. For her, guiding the visitors is not just a profession but also a great opportunity to be an emissary of Nepal as she is always representing her country, and making visitors feel welcomed in Nepal. 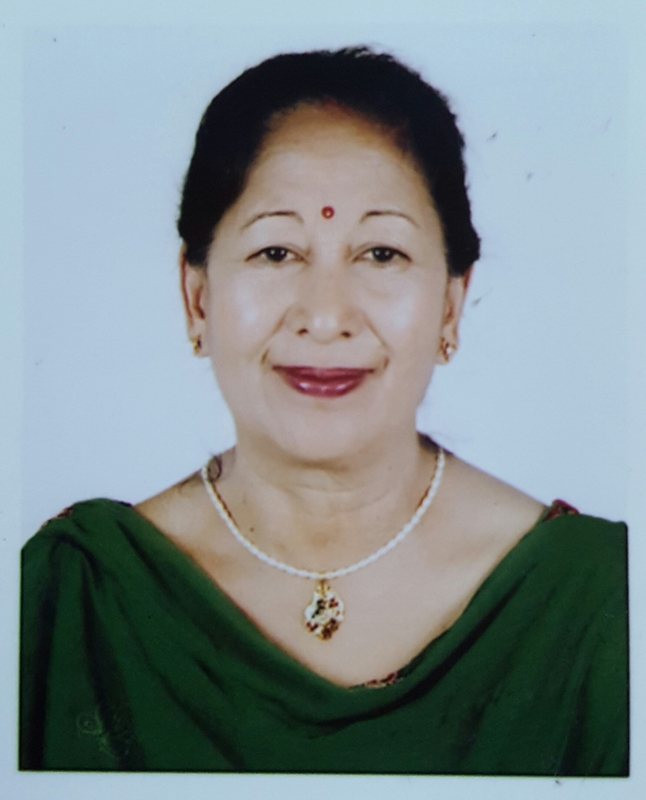 Now, in her late fifties also, she is equally dedicated with same enthusiasm in the industry and committed to make more people know about the wonders of Nepal. Kumar Khadka is born in Okhaldhunga. 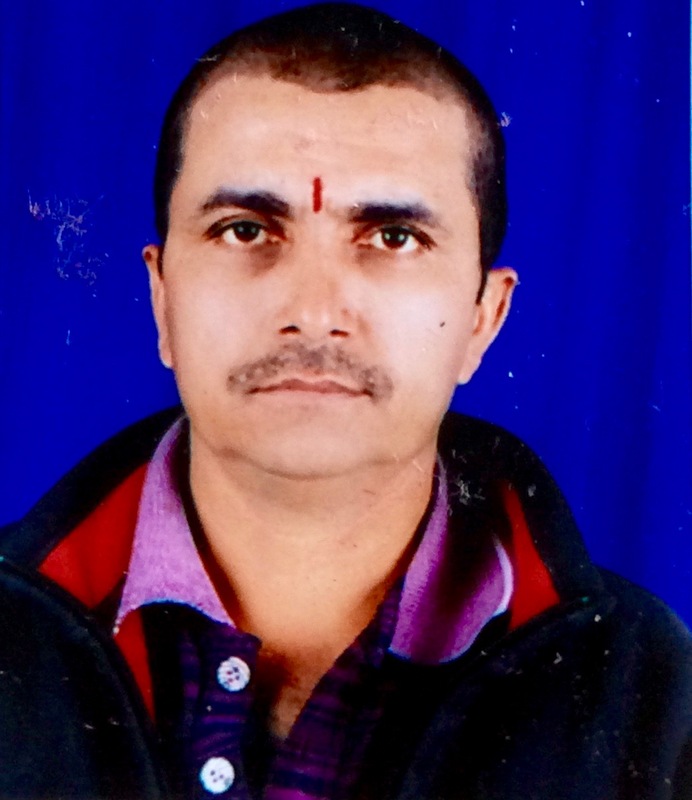 He is an experienced Trekking Cook and Trekking Guide. He started working as a Trekking Cook from 2002 and continued the profession for 10 years. While working as a Cook, he grew an interest towards guiding trekking groups. Afterwards, with the working experience of a decade and proper training, he started guiding trekking groups. Till date, he has worked in almost all the prime trekking destinations of Nepal including Everest, Langtang, Annapurna, Mustang, Rara, Simikot, Dolpo, Kanchenjungha, Rolwaling, Ganesh Himal, Manaslu, Tsum Valley, Dhaulagiri, Panchase Siding, Mardi Himal etc. His experience also includes climbing some popular trekking peaks including Mera Peak, Island Peak, Thapa Peak and Yala Peak. His peak climbing experience has added extra proficiency in his performance during trekking adventures. Babu Ram Bhattarai is an International Cook (Outdoor) with an experience of more than a decade. He started working in 2003 and till date, he has worked for almost 20 expedition groups including Discovery (Canada) and NASA research groups. His experience includes working in Everest Expedition for 12 times (once from North Side), Cho-Oyu Expedition for 2 times, Manaslu Expedition for 2 times, Pumori Expedition for once and Everest Base Camp Trekking group for 2 times. Since, he has a remarkable experience of working with high profile groups also, his expertise is considered highly significant in the team. His contribution has been one of the key factors for our guests’ satisfaction and warm compliments. Born in Waku-4, Solukhumbu, Ngang Pasang Sherpa is a versatile guide. He has been working in the field of trekking and mountaineering since 2005. He has the experience of many Himalayan giants including Everest. Till now, he has summited Everest (three times), Lhotse (two times), Madri Himal (three times), Himchuli and Amadablam. Besides, he has also done Mt Kailash Circuit, one of the most arduous and demanding trekking adventures in Tibet, for 18 times. Because of his efficiency and diligence as a professional guide, he has always been a valued member of the team. Pemba Sherpa was born in Lamabagar-1, Dolakha. As he was born within a climbing community, he grew an interest for trekking and mountaineering from an early age. After some initial involvements as a support staff in the field and proper trainings, he started working as a Climbing Sherpa from 2002. Till now, he has climbed more than 15 Himalayan peaks including Everest, Cho-Oyu and Manaslu. His climbing experience shows an impressive success records that include the summits of Everest (4 times from both sides), Cho-Oyu (2 times), Manaslu, Ama Dablam, Annapurna 4, Island Peak (3 times), Mera Peak (3 times) and several trekking peaks. Kumar Gurung is a well-known and experienced chef in the field of trekking and climbing expeditions. 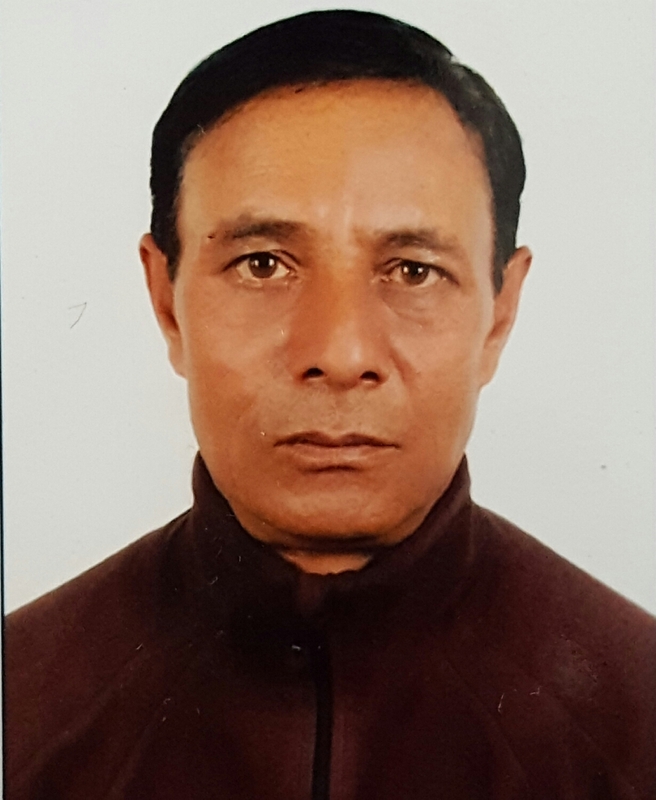 Born in Taplejung on 02 July 1970, he started the profession in 1995 after being trained as a cook in Continental, Chinese, Thai and Bakery. He has also received training from Nepal Academy of Tourism and Hotel Management (NATHAM), a prestigious academy to produce skilled manpower for Hospitality and Tourism industry. Within the duration of two decades of his professional involvement in the field, he has worked in numerous expeditions including Everest (12 times), Cho-Oyu, Makalu, Baruntse, Labuche Kang etc. He is especially popular among our guests for his skills, creativity and commitment to quality.